Hate making breakfast? Don’t feel like cooking in the morning? 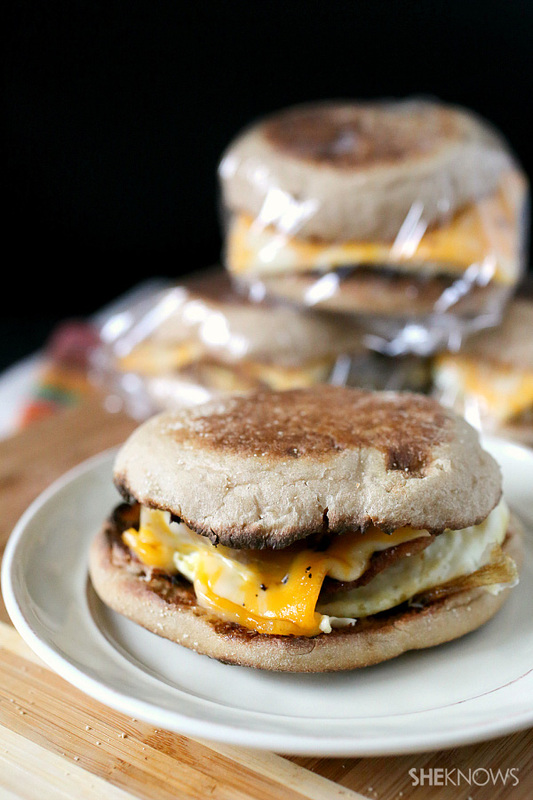 These quick-and-easy breakfast sandwiches can be made in advance and then frozen for a grab-and-go breakfast. As much as I love a hot meal in the morning, I’m the worst at getting up and eating. I’m usually still tired and the thought of cooking is not something I’m interested in. 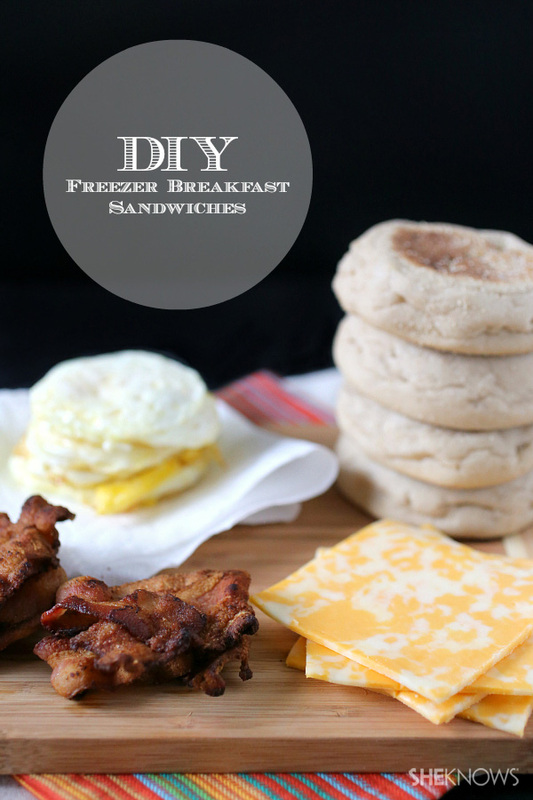 That is why I finally got around to giving these homemade freezer breakfast sandwiches a try. You can use whatever type of meat you like (bacon, ham, sausage, etc.) or just use cheese to keep it vegetarian friendly. They’re easy to reheat, and, depending on your microwave, can be ready in under 2 minutes. The best part about these sandwiches is they are the perfect on-the-go type of breakfast and keep you away from the drive-thru. Don’t worry about reheating these. The English muffin stays soft and since you cook most of the moisture out of the eggs and meat beforehand, it doesn’t get overly soggy. Cut English muffins in half and toast, set aside. Cook your choice of meat and set aside. Add a drizzle of olive oil to a small pan and add a 3-inch biscuit cutter to a pan. Break the egg into the cutter, break the yolk and let it cook for a bit to set up and remove cutter. Flip the egg to the other side and fry until fully cooked. Note: When you break the egg into cutter it may leak out a little but it helps keep the general shape. If you’re not too overly concerned about the size of your egg you can also just cook it free form in the pan. Cook all the eggs and set aside. Once all the ingredients have been cooked, start assembling your sandwiches. 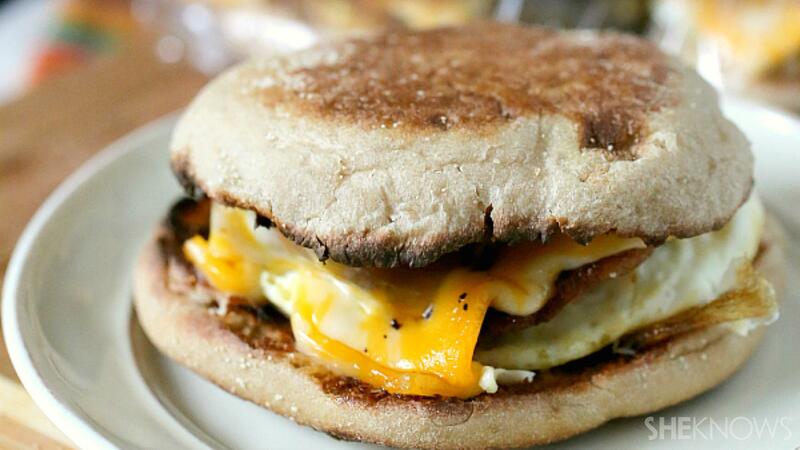 Lay out 6 English muffin bottoms and top with eggs, bacon, cheese and English muffin top. Lay out 6 pieces of plastic wrap and wrap each sandwich. Wrap each sandwich again with another piece of plastic wrap. Add wrapped sandwiches to a large zip-closed bag and put in the freezer. To reheat the sandwiches, remove the plastic wrap, microwave on a plate for 30 seconds, open the sandwich and cook for another 45 seconds. Total heat time will depend on microwave strength. It could take anywhere from 1-2 minutes to be completely cooked.